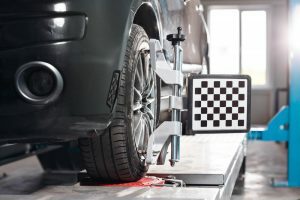 Driving when your wheels aren’t properly aligned can lead to a host of issues, and may cause problems with your steering, cause your wheels to wear down, unevenly, and mess with your fuel efficiency. For that reason, Master Muffler is proud to announce that we are offering tire alignments for all of our customers! Together, we can help keep you and your vehicle on the road! Learn more about our alignment services, below. At Master Muffler, our mechanics are dedicated to ensuring that your vehicle is operating at peak capacity, and that you are safe when you drive it. Our vehicle alignment services are comprehensive, and come with a warranty to ensure that the job is done right. We align each vehicle to the precise angles that each manufacturer recommends for the tire. Front and rear steering adjustments, done according to the camber, caster, and toe angles on your vehicle. Tire tread and air pressure checks. A road test after the vehicle’s alignment is complete. To be safe, get your alignment checked whenever you get an oil change (which is what many manufacturers recommend). On the other hand, a general rule of thumb is to get your alignment checked every 6 months, or every 6000 miles. However, if you think your steering is misaligned, then you should take it into a shop, right away. Your steering pulls you to the left or the right. The rubber on your tires is wearing down unevenly or noticeably quicker than their recommended lifespan. Your tires squeal when you are driving. Your steering wheel is misaligned, but your vehicle is still driving straightforward. Come in for an Alignment, Today! If you are concerned about your vehicle’s steering and alignment, then don’t hesitate to stop in and have one of our friendly technicians check it out. It’s always better to be safe than sorry. The technicians at Master Muffler can conduct repairs and maintenance on your vehicle quickly and efficiently, so that you can spend more time on the road! Check out our locations to see where the closest Master Muffler is to you.